It was quiet when we woke up this morning. Snow quiet. Over night, we received a couple of inches of snow on top of the previous few from the other day. Snow acts as muffler and creates a calm, especially on the weekend when the concern about a nasty work commute isn’t there. Unfortunately, snow gets a bum rap; it just isn’t winter without it. Today’s was a dry, fluffy snow, which meant the temperatures outside were rather cold. Anyone who’s shoveled snow will quickly remark that it’s better to shovel this snow than the “warmer” weather, heavy wet snow. With the light stuff, one can clear the walkway, driveway and car in a matter of minutes, which is exactly what we did. It was too pretty outside so we opted to go out for breakfast. Before leaving the house, though, we dressed in our L.L. 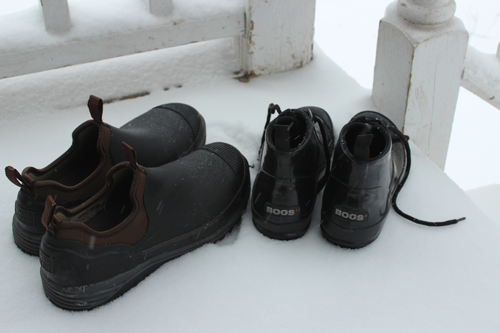 Bean winter jackets and, most importantly, put on our favorite winter boots: Bogs. We learned about Bogs a few years back from Deb Paisley of Paisley Farm & Greenhouse in West Boxford, MA. We thought, “When a New England farmer recommends a boot, he (or in this case she) knows this from practical use. We picked up ours at the Kittery Trading Post in southern Maine. It’s turned out to be one of the best things we ever did. Though Bogs aren’t from New England, they’re perfect for our region. With Bogs on and feet warm, we hopped in our S.U.V. Yes, it has four-wheel drive (4WD) to make the journeys around Maine, New Hampshire, Vermont, Massachusetts, Rhode Island, and Connecticut a little easier when the white stuff falls. 4WD, unfortunately, does not turn a New England country road with 14 inches of snow into a flat dry interstate in summer. We see more 4WD vehicles on their roofs during a snowstorm than regular cars. Nonetheless, it helps, but only with a healthy dose of Yankee pragmatism. We went out, had a great breakfast that included Rhode Island-style jonnycakes with real Vermont maple syrup. After a pleasant and warm trip out into the snow, we’re now back home, sitting by the fire, and happily telling you about it. Thank goodness for warm shoes and four-wheel drive. How those books got onto the shelves is also a story, one that’s really a narrative of life. When we first started dating in the 1980s, we often found ourselves in a bookstore after a nice dinner or an invigorating hike. (Things haven’t changed much for us since.) It didn’t matter whether the bookstore had new or used books, because what was on the pages of those books always left a lifelong impression. They became part of us. Perhaps the story we write now is an attempt to attach us to our books, inspiring a future reader long after we’re gone. Today, when we pull a book off the shelf, it immediately evokes memories of the day we bought it and of that particular time in our lives. For instance, we fondly remember two cookbooks (one Greek, the other Eastern European) that we picked up in 1988 after a fall visit to Pack Monadnock in Peterborough, NH. Now, when either of those books is removed, we recall hiking the Wapack Trail that day, dining afterwards at Hiroshi Hayashi’s innovative Latacarta restaurant, discovering a great recipe for Shopska salad and listening to Pachelbel’s Canon later that evening. It’s fascinating how our brains retain information by association. Other bookshelves tell stories too. Recently, we vacationed by the Oyster River in Chatham, MA on Cape Cod. Like many New England seasonal, coastal properties, our rental home had three elements familiar to many of us: beach paintings; musty smells; and bookcases of old, out-of-print books. Such bookshelves are a chronicle of decades of New England guests and snapshots of periods in American history. We were immediately drawn toward the hardcovers and paperbacks in our rental cottage. 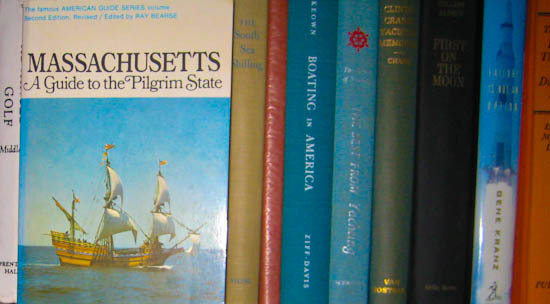 One title in particular drew our attention: Massachusetts: A Guide to the Pilgrim State, edited by Ray Bearse. It was printed in 1971, the second edition of a book originally commissioned by the WPA in 1937. In the preface, the editor reflects on how much things changed in the time period between the first and second editions. Reading the latter edition forty years after its publication left us equally moved. It not only provided an interesting view of how much things had changed since 1971, but also affirmed how many of those things we hold so dear remain constant. But with the book in our hands we asked: Who put this on the bookshelf in Chatham? Why did they come to New England? What happened to the author? Why did he choose to write about Massachusetts? What other visitors over the years picked up the book? Did the book influence their visit? During that same trip, we went to some used bookstores on the Cape hoping to find another copy of the book. 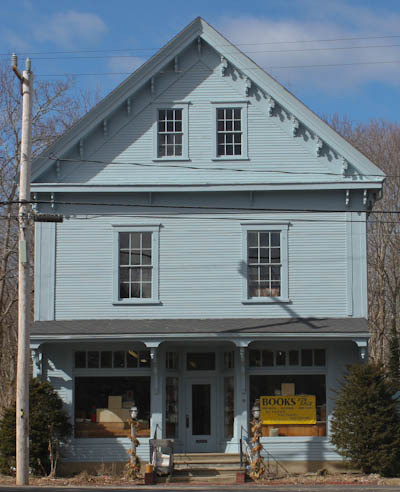 Even one of our favorite New England bookstores, Parnassus Book Service in Yarmouthport, MA didn’t have it. After several more attempts we realized our search might be futile, but we finally found the book online, and bought it. At the time of this writing it hadn’t yet arrived, but we know the book will end up on one of our bookshelves. From now on when we remove it from the shelf, we’ll recall our trip to Chatham, reflect on how much Massachusetts has changed, remember a wonderful vacation with family, and savor the smell of just-ground coffee and fresh-baked muffins from the Chatham Village Café where we wrote this story. New England blogger friends recently asked, “Where have you two been?” Clearly, we have not been maintaining our writing cadence. “On a fascinating journey,” we remarked. 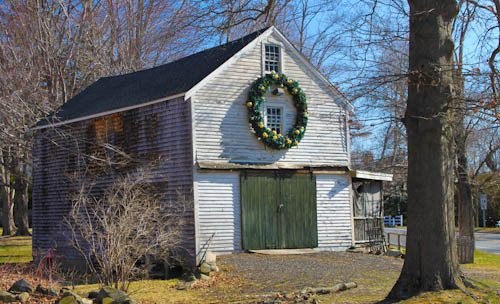 Since last fall, we have been researching the origins New England food, which has taken us to libraries, bookstores, docks, museums, farms, root cellars, markets, and pantries across our six northeast states. We’ve met food historians, librarians, archivists, chefs, farmers, fishermen, family cooks, and various foodstuff purveyors, all of whom are helping us weave the strands of a fascinating story. With books, journals, maps, menus, cooking instruments, and other regional food paraphernalia now festooning our home office, we realize how intertwined our New England history is with food. And it’s not all glamour either. History never is. Though the New England food journey is deep and diverse, it helps us better understand who we are, where we came from, and why we’re willing to argue over such things as maple syrup, fried clams, pizza, oysters, whoopie pies, johnnycakes, scrod and beer. Stay tuned because we’ll be sharing our discoveries. There are many common signs of spring in places where changes of season are clearly evident: flowers pushing up through the last patches of snow to reach the increasing sunshine; birds returning to nest; and frogs serenading from their vernal pools. Here in New England, we have a few more signs of spring: towns repairing potholes; rural cars tackling mud; schoolboys stripping down to shorts and tee-shirts on the first day over fifty degrees; and crowds returning to Fenway Park for Red Sox baseball. We also have a brief, rite of spring that provides lasting and sweet pleasure for the remainder of the year: maple sugaring. Maple sugar season typically begins in March and lasts until early April. It begins when warm days follow cold nights and trigger the sap to flow or “run.” During this brief season, New England becomes host to many sugar shacks, which are small cabins where collected sap is boiled into maple syrup. When buds appear on the maple trees, these shacks quickly disappear as the sap ceases to flow. 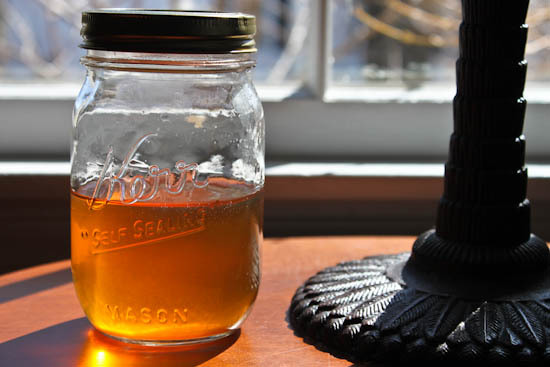 This entire ritual takes place quietly, often going unnoticed by most people, unless one is in the maple sugaring business or doing it as a hobby. It’s interesting to consider that this all started with the Native Americans. 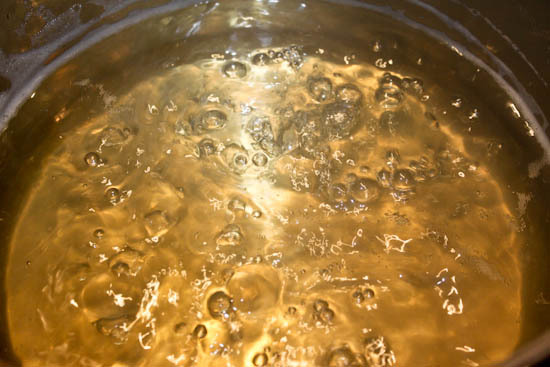 Little did we know – or anticipate – we’d be joining the world of maple sugaring and syrup production. And it was all by mistake. The most compelling reason why we bought our 105 year old fixer-upper several years back stood outside our front door: a huge, beautiful and majestic 100 year old street maple, that we named “Big Bertha.” Though we heard rumors that the previous homeowners had tapped Big Bertha for syrup, we had become so busy that we neglected to follow up on our plan to continue their tradition of making syrup. 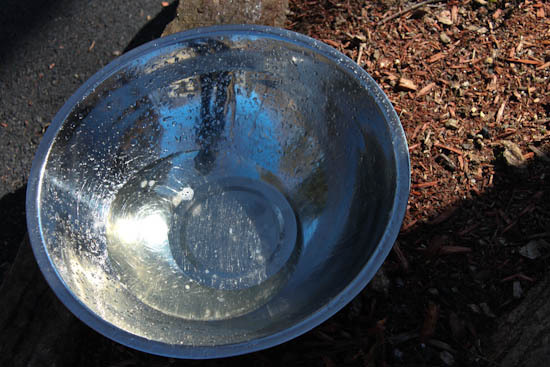 This year – by accident – we had no choice but to try our hand at maple sugaring. Last November, Big Bertha was maimed during the installation of a new waterline to our home. She lost part of a major limb as a result of the backhoe placement. This incident came as quite a shock, especially since the branch was removed without our consent. Bertha sustained an unfortunate injury, but it was better to lose a limb than to lose an entire tree. 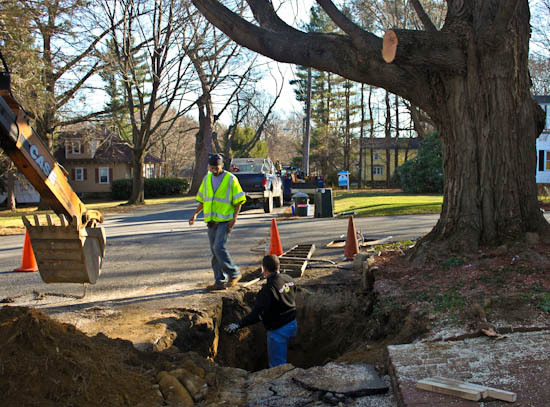 According to the contractor, we had been just minutes from losing her if the water line hadn’t been able to be snaked under the tree. Big Bertha sat right on top of the 105-year-old water line. Big Bertha spent much of the winter resting and recuperating, blanketed by mountains of snow. But a few weeks back, the warm days brought her to tears, literally. She began crying from her wound. The constant weeping, though rather upsetting to us, led to the realization that her sap was running. 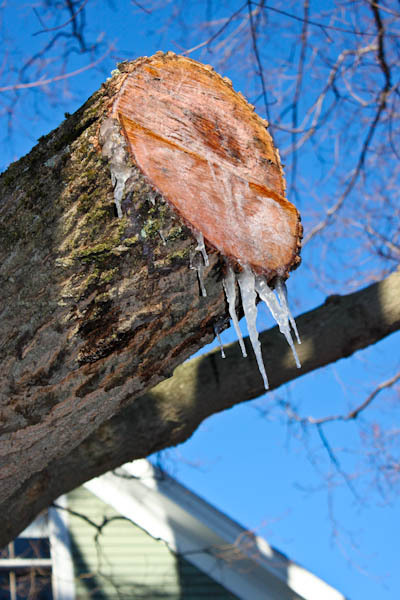 Maple sugar season arrived when we realized her limb became a huge tap. With pan in hand, we rushed out to collect the sap. 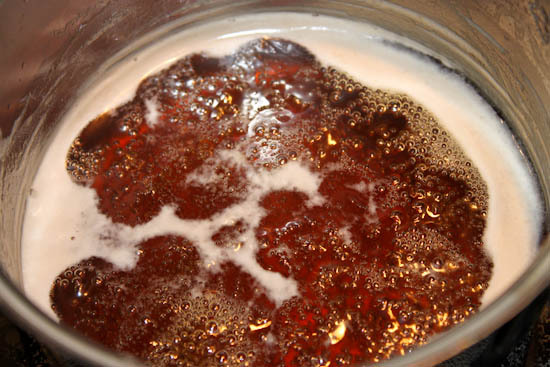 Using what we captured, we made wonderful syrup. That old saying came to us: “When life hands you lemons, you make lemonade.” We modified it for our purposes: “When a contractor wounds your maple tree in the fall, you make maple syrup in the spring.” It’s just a bit of consolation for the loss of her beautiful limb, which we will miss dearly when the leaves arrive. Perhaps it was her way of sharing this part of her long life with her new guardians. So what was the result? Bertha’s syrup was delicious, the best we’ve ever had! 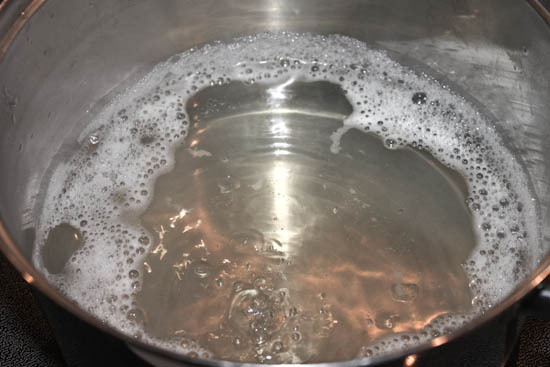 As the sap boiled down to syrup, the aroma permeated the house. We were left with a nectar rich in maple flavor with stunning amber color and clarity. Fortunately, her wound should heal by next year, so we’ve decided to buy some real taps for next season and continue this New England tradition. Maple sugaring was a great experience, and a sweet way to end a long, bitter winter! Because we travel all over New England, we’re often asked: “How do you know where to drive?” Though we don’t think about it much, we use a combination of process and intuition when we hit the roads of Connecticut, Maine, Massachusetts, New Hampshire, Rhode Island, and Vermont. On the process side, we have a large number of maps, some quite new and many over 100 years old. We also have smart phones and global positioning system (GPS) devices. Additionally, we maintain several databases of information, much of which includes historical village records as well as primary and secondary research. On the intuition side of the equation, we determine our next turn by looking at architecture, stonewalls, and old roads that often include names of neighboring towns, points of interest, and historic families. Our intuition also guides us to the “A” roads, such as Route 1A. What’s the significance of an “A” road? To us, it’s where you discover New England. Many “A” roads are original routes through the old towns, villages, and hamlets; it’s where you find classical architecture as well as centuries of history. They’re often the most scenic (and winding) roads as well. 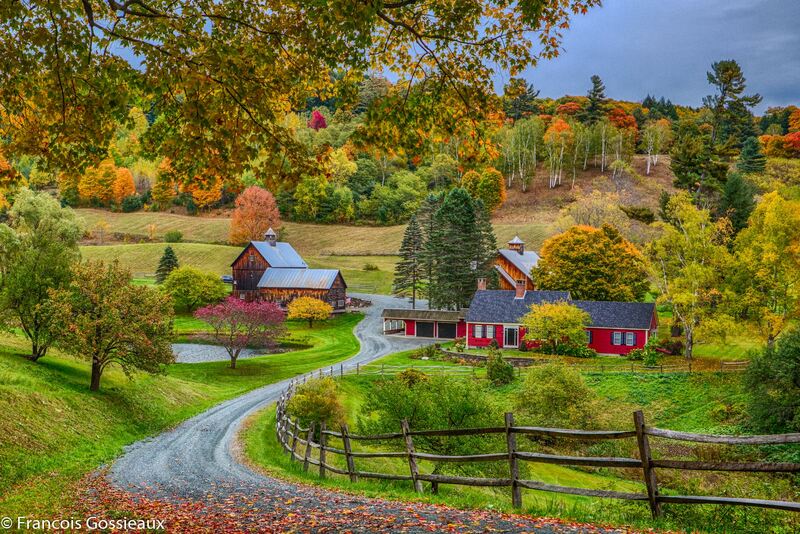 Many original New England roads began as old Indian trails or were created by settlers to support commerce and trade. 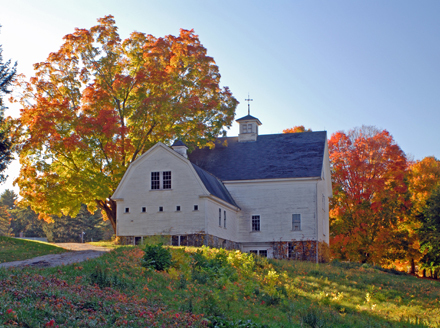 Throughout New England roads such 1A in Maine, Massachusetts, and Rhode Island, 12A in Vermont, and 4A in New Hampshire offer visitors a nice retrospective of America before the automobile. Note that the route number and less-frequent, accompanying letter designation did not show up until later. 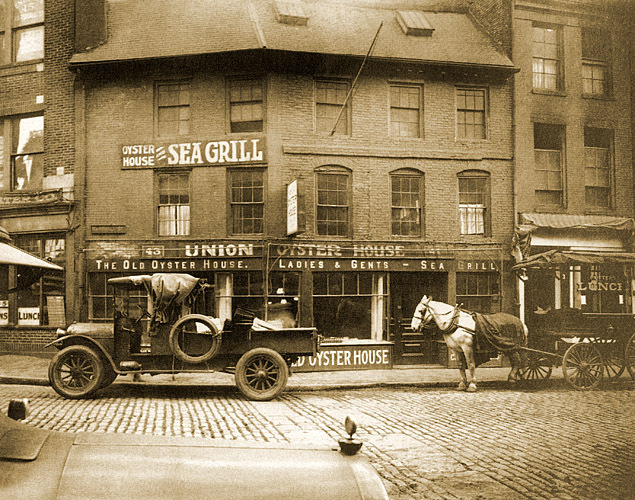 As the popularity of the automobile in New England increased, cities and towns not only improved old, existing roads, but made new throughways as well. In 1911, the Quebec-Miami International Highway was created as the major north-south travel passage combining old and new roads. It was renamed The Atlantic Highway in New England in 1915. By 1922, improvements and new sections were added and it was renamed Route 1 in New England; the entire route to Florida was called Route 1 by 1926. 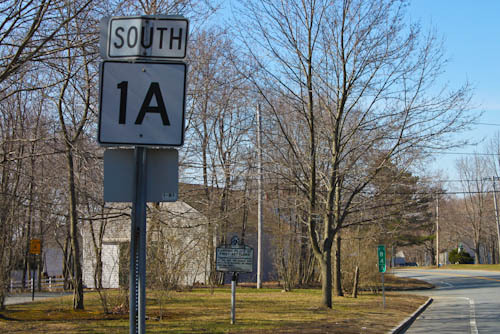 Route 1 became the commerce route for many New England towns, driving a shift from many of the older routes that would subsequently be renamed “1A.” Though research is limited on the letter designation, one may speculate there were economic motivations for bringing travelers back to the old parts of town. Decades later, the Interstate system in New England was started in the 1950s, with Interstate 95 becoming the bypass (in most parts) to Routes 1 and 1A. Interstate 95 from New England to Florida was completed in 1970. In this region it’s not unusual to find Route 1A, Route 1, and Interstate 95 in close proximity to one another. 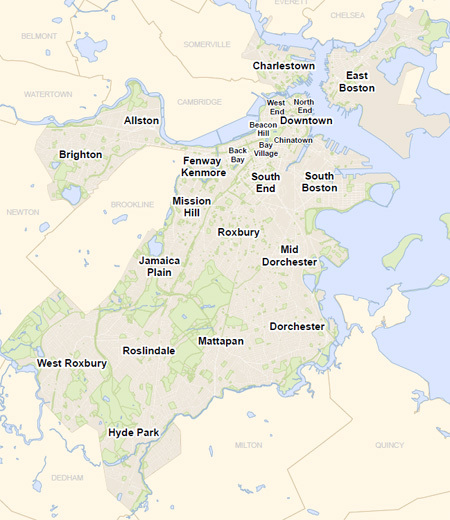 Though each of these roads represents different times in New England history, the richest and most interesting is 1A. One of our favorite Route 1A drives is from Salem, MA to York, ME, with short stops in many coastal towns such as Newburyport, MA, and Portsmouth, NH. Be sure not to miss smaller towns along the way, as all have a great deal of history, charm, and things to see. Route 1A is also a cornucopia of site markers, small signs that evoke another era. 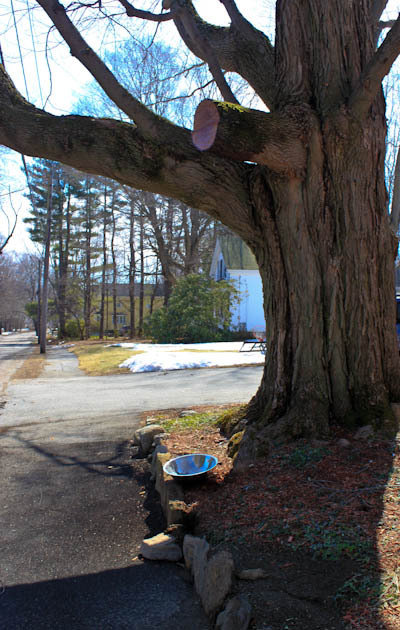 Recently we stopped at one identifying the “Minister’s Woodlot” from 1660 in Rowley, MA. Enjoy Route 1A in New England. Catch a flea market. Visit a museum. Nosh on some fried clams. It’s worth the diversion from Route 1 and Interstate 95. Please note that many sections of Route 1A are not contiguous and frequently branch off and back onto Route 1. We’re fond of Cape Ann, and especially Gloucester, the oldest active fishing port in the United States. This city, which dates back to 1623, has it all: history, tradition, ethnicity, restaurants, art, museums, shops and natural beauty. We never need an excuse to visit the area, but when we received an invitation to join some North Shore friends for dinner at the Alchemy Bistro in Gloucester, we gladly accepted – or at least one of us did. The other, unfortunately, was hosting an event further inland in central MA, but let’s stick with Gloucester and return to the coast. Alchemy is defined as the act of turning ordinary metal into gold. The aim of Alchemy Bistro is to turn extraordinary ingredients into culinary gold. On this night, the alchemist (also known as Chef Jeff Cala) spun course after course of wonderful dishes, mining flavors from Asia, Italy, France, and America, many of which were sourced with local, New England ingredients. The meal was well organized and delicately balanced a bit of formality with a lack of pretentiousness – not an easy task at a tasting dinner. The staff maintained a nice cadence, allowing us to maintain lively and continual conversation over the centerpiece of food. The chefs emerged at each course and explained the preparation of the dishes along with the sourcing of ingredients. Concurrently, Matt Rose (the general manager) would share his vast knowledge of wine, beer and mixology by offering pairing suggestions for each individual item within the course. Logistically, the dinner, spread between two tables, blended individual courses separated by samplings of communal tapas. The tapas selections were tastefully presented on rustic serving boards made especially for this evening by the artisans at Walker Creek Furniture of nearby Essex, MA. We’re partial to New England ingredients, even if that means non-edible ingredients (such as serving boards) too. 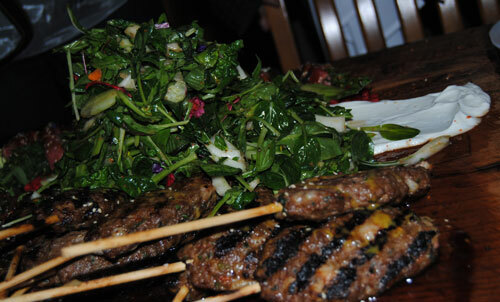 The dinner selections, representing a sampling of the broader menu, were diverse and creative. Some of the standouts and liquid accompaniments for the evening included: wild boar and native shrimp chopstick roll; cheese sampler paired with an Estrella Damm Inedit witbier from Barcelona by Ferran Adrià (a new favorite); black pepper pappardelle carbonara with a farm raised duck egg (that was picked up by Chef Cala somewhere along his drive) nicely matched with Corte Rugolin Monte Danieli Amarone Classico; and, finally, warm chocolate soufflé complemented by a stunning Goose Island Bourbon County Stout. 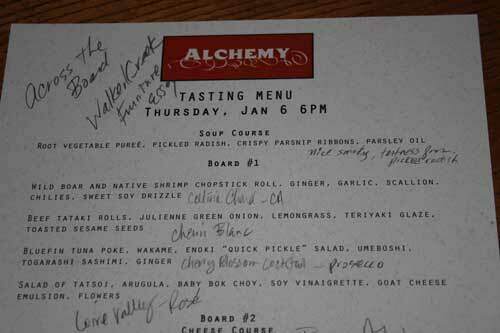 I applaud the team at Alchemy Bistro and their creative spin on New England cuisine. 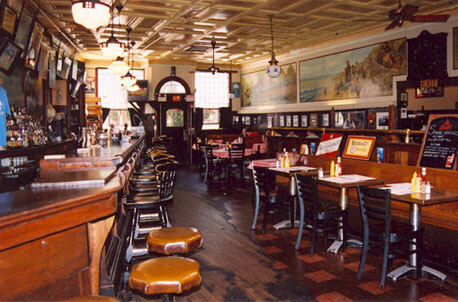 One doesn’t need to drive to a major city like Boston to have a wonderful dining experience. Alchemy proved that. 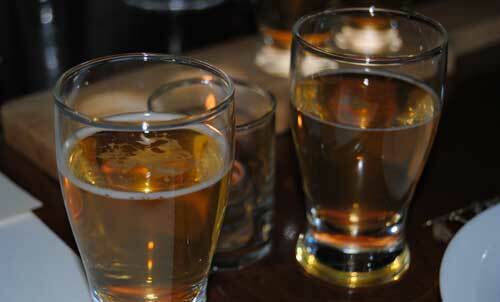 The restaurant plans to host more of these events, which is good news for the New England palate. Visitors, as well as locals, north of Boston should seek out the many wonderful things both culinary and non-culinary in the region. Take in some of the Gloucester sights and then head to Alchemy to reflect on them over a delicious dinner. Snow. Snow. Snow. There’s always a frenzy when a good ‘ole nor’easter works its way toward New England in the winter time. The store shelves are cleared of bread, water, and milk. The firewood is piled high. Many are glued to their televisions, changing stations from one meteorologist to the next looking for any extremes in the forecast. Have we not seen this before? This is New England and it snows here in the winter. Last year we commented on the non-stop snow. This year, we’re turning to Whittier for some rationale reflection. For those of you not familiar with John Greenleaf Whittier, he was a famed 19th century American poet born in 1807 in Haverhill, Massachusetts. Today, he is not well known, perhaps his works eroded by the tides of time or eclipsed by the moon of Robert Frost. In Essex County in Massachusetts, you’ll find his name attached to the occasional street or school, likely found in a Victorian-era neighborhood. His homestead is remarkably preserved, though like many great buildings in the region, only open seasonally. Nonetheless, we thought it fitting to summon Whittier on this cold, windy, and snowy New England evening. We’ve included an excerpt below, but the complete poem can be found here. In the meantime, we’ll go sit by the fire, admire the Christmas tree, and listen to the snow brush up against the window panes. Credits: Mural from the Whittier Home, Amesbury, MA. Painter, Jon Moores, photo by Pam Fenner. On nothing we could call our own. A universe of sky and snow! 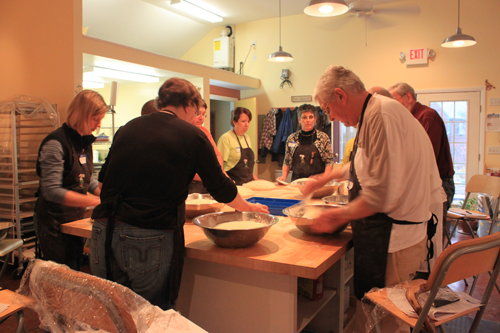 Recently, my friend Erica Holthausen and I were fortunate to grab the last two available seats for an Artisan French Bread class at Stone Turtle Baking & Cooking School, a small, family run baking school in Lyman, ME. Stone Turtle is an unpretentious, hidden gem that turns out some wonderfully executed and practical lessons on the art of bread baking. (Hidden indeed as the directions had us turn at an old landmark, roadside stand painted with a weathered Moxie logo.) On this brisk fall day, ten participants surrounded the kitchen’s large rectangular table. The group makeup was diverse: three men and seven women ranging in age from late twenty-something to over seventy years. The owners Michael and Sandy Jubinsky are native New Englanders originally from Lowell, MA. Michael is a retired engineer, and Sandy, a talented artist specializing in painted porcelain. Both have been cooking, baking, studying and writing about food for more than forty years, which shows as they work harmoniously in the Stone Turtle kitchen. Michael leads the class instruction while sharing his passion and skills for producing all forms of bread, the proverbial staff of life. He is an incredibly patient man, capable of teaching everyone from the novice baker to the more experienced professional. He couples this with a great sense of humor and a vast reservoir of knowledge. Sandy wears a name tag that simply says “The Boss,” and is flanked by the couple’s son, John, who keeps the Le Panyol oven fired up and ready. Together they help move Michael along at a comfortable pace. Le Panyol Bread Baking Oven "The Stone Turtle"
Before he embarked on making the bread, Michael quickly noted that one must bake at least 2,000 loaves before feeling success. As daunting as that sounded, he further added that even with that behind him or her, a bread baker will continue to refine skills, striving to improve with each subsequent loaf. As class began, we were each given equal portions of poolish, a pre-ferment originally used by Polish bakers in the nineteenth century and later adapted by French pâtissiers in pastry making. The purpose of the poolish, which Michael made the evening before, is to improve the bread by increasing the acidity, extending the shelf life, and allowing more depth of flavor to develop prior to mixing the final dough. It is, however, not a sourdough starter. Everything involved in the entire baking exercise was done by hand -no mixers. 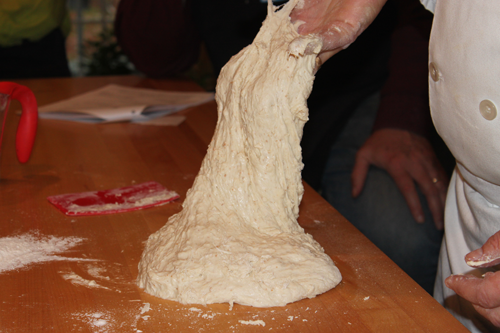 The dough, surprisingly damp and sticky, coated everyone’s hands and echoed Michael’s mantra of “wetter is better.” Between the rising, resting and shaping, he demonstrated how to make a variety of French breads along with a few Italian breads. For the latter, he used French techniques to make both a rosemary focaccia and a pizza crust, which we later enjoyed for a delicious lunch. Much like an old French Citroën deux chevaux automobile, the Le Panyol oven (a.k.a. “the Stone Turtle”) is a labor of love. It requires multiple cycles of heating and cooling over several days to gradually raise the temperature to the desired level for baking. Just as we were preparing to bake the bread, John removed the oven coals and said that no additional heat was necessary; the retained heat, stored in twelve inches of ceramic, would be sufficient. 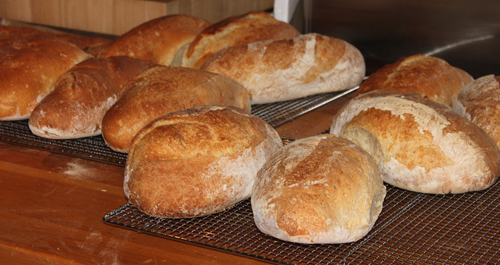 Bake times will often vary because no adjustments are possible once the breads go in. 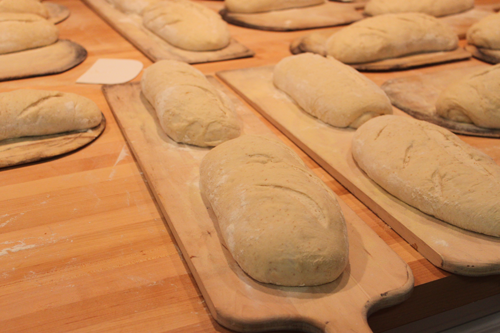 The class participated in every step of the baking process, right down to a rapid, continuous procession of peels (long handled paddles used to place bread in a deep oven) orchestrated by Michael who carefully placed our risen breads in the hot oven. While waiting for our newly conceived children to finish, we sampled a French boule and a boule d’olive that Michael made earlier in the day. If ours turned out half as good, we were going to be in for a treat! Much of the baking equipment was handmade out of practicality, which enhanced the charm and rustic feel of the whole experience. The paddle we used to gently roll our risen dough onto the peels was constructed of cedar clapboard donned with pantyhose. It performed flawlessly. After cleaning up and saying our goodbyes, Erica and I — along with our beautiful bâtards — returned home. The breads were exceptional. So memorable was this experience that I promptly signed up the other Palaverer for the Artisan Italian class next month. Our Christmas baking should prove interesting. Thanks to the team at Stone Turtle Baking & Cooking School (Michael, Sandy, and John) for the wonderfully rewarding, educational, and delicious November day in Maine. I have only 1,998 more loaves to go! 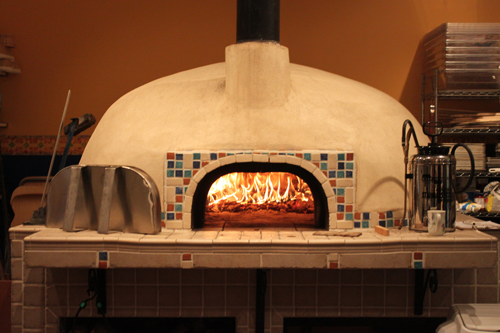 Whatever your baking ability, the Le Panyol at Stone Turtle is quite an experience. Finding a little bit of France Down East in Maine made it even better. It’s October in New England, which means we’re getting treated to our annual parade of colors from the trees to the pumpkins to the mums. Though we’re not a big region of the country, we do have enough climate diversity that we can enjoy the show for about a month. Missed it in Vermont and New Hampshire? No problem. Catch it in on Nantucket or in Connecticut. 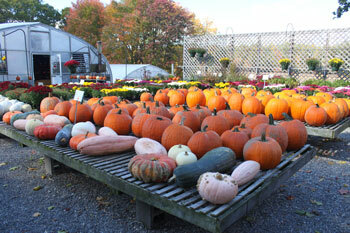 But there’s so much more to fall in New England; the other senses won’t be denied. Many of us know when the season arrives not just the the sight of leaf changes, but by the smell of the season. Fall has a different aroma and we – either consciously or subconsciously – seek it out. Our palettes won’t be denied either because the last of the harvest brings its own special seasonal offerings. Recently at a harvest festival in Rockport, MA we had our first mulled cider of the season made from local Cape Ann apples. It certainly took the edge off the remains of an Atlantic storm that was kind enough to provide some very stiff winds on a brisk day. We’d be remiss if we were to forget the sense of sound. Though the equinox begins to usher in a quieter time, it also gives us the rustle of newly-fallen leaves, closing music for a beautiful season. And finally, fall affects the sense of touch, which could be the brush with an early snow flurry or the feel of a just-picked apple. 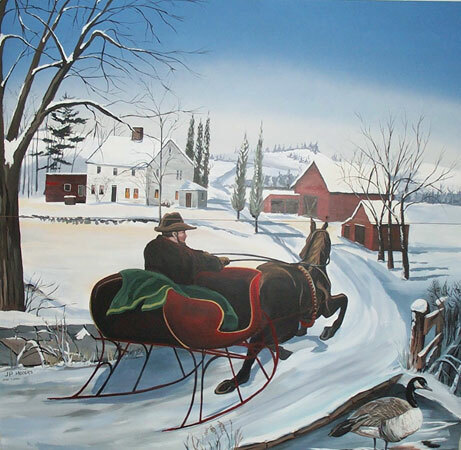 Seasons are a gift of place and New England is one of the most generous in the country. Your senses will be grateful.